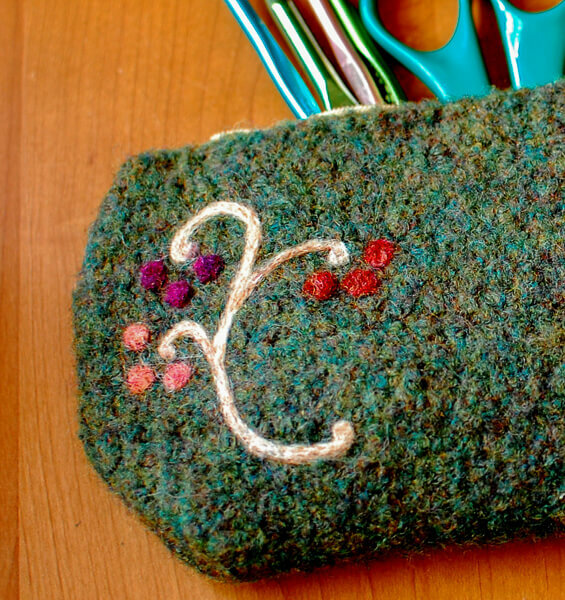 Here is a quick and easy pencil case pattern and fun felting project too! 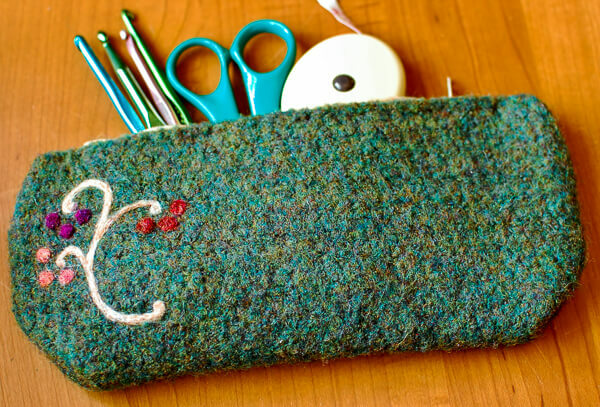 This handy little case is the perfect size for pencils, hooks, or just about anything. Before you begin, make sure to choose a yarn that fill felt. See my post Felting Knitting & Crochet for a list of fibers that felt. I used a 100% wool yarn (make sure to not use “superwash” wool!). I used Cascade 220 for this project. Since all yarns felt differently, I worked up a little test swatch with the yarn I chose to see how much my piece would shrink. This gave me the information I needed to calculate how large I would have to make my case to have it be the size I wanted after felting. I wanted my finished case to be about 9 in wide by 4 in deep. So, using the measurements of my test swatch and the formula I showed you in my Felting Knitting & Crochet post, I determined that I would need to work up a square of about 10¾ in wide and 10½ in long to achieve my desired measurements once felted. Foundation Row: Work 1 dc in 4th ch from hook and each ch across — 36 sts. Row 1: Ch 3 (counts as st), work 1 dc in each st across — 36 sts. Rows 2 through 19: Repeat Row 1. Fold piece in half so that the top row and bottom row line up on top of each other (this will be the top opening of your case). Working along the sides, work 1 sc through both layers to join sides. Now it is time to felt your case. For a felting refresher, see my Felting Knitting & Crochet post. Once I was happy with the amount the case had felted, I rolled the case between two towels to get out the excess water. Then I shaped my case the way I liked it and crumbled up a plastic bag to keep its shape. Once the case is dry, sew on a zipper and you’re all set. I even dressed mine up with a little needle felting design … I love how this came out! To see more crochet cases and my other free crochet patterns, click here. Thank you so much for sharing this info! I knew this was possible, but couldn’t quite figure it out for fear of ruining beautiful and expensive yarn. Can’t wait to try this and share with friends! Hi Kara I love this and I’m trying felting for the first time, with this project!!!! I was wondering if you could tell me what crochet hook you used? Thanks!!!! I just watch a couple tutorials on needle felting, but I don’t understand. Did you glue all those pieces on for the design? Hi! What a fun pattern and it is my first try. I was wondering if the zipper is hand sewn in? I will share a pic when it is done! Thanks for the free pattern. You do such beautiful work. What color and brand of arm did you use? It’s beautiful! Hi Ann 🙂 I am not sure of the exact color, but I know it was Cascade 220 Wool yarn. Hope that helps! Yes, but not like the rest of the case … it is needle felted. Amazing post….!!!!! really i appreciate it..
Just wonderful! I also love the needle felting! It looks so super elegant and fancy that way. I agree, the zipper sewing stresses me out a bit–but this would make a fun project to try that out on! Thanks for sharing! This is absolutely adorable!! I love the felted look. And the needle felting design is the perfect accent! You need to do a crochet along so I can learn all this fun stuff!! Pretty look and another way of felting. Very nice pencil case !